Do you enjoy Bible Trivia? You have come to the right place! Launch into an exciting Treasure Hunt on Bible Trivia John. Studying and applying the Word of God is the most important thing we can do in life. On this page you can start an exciting treasure hunt through the Gospel of John. There are ten questions on this page. You must answer each question correctly and then follow the directions in the Password Decoder. This will give you the password to get to the next page. Each page has Interesting Bible Trivia John Facts, Ten Bible Trivia John questions, and the password decoder. There are ten pages and then the final Treasure Page. Prove you are the first one to the final Treasure page by solving the secret verse! 1. Correctly answer each Bible question. 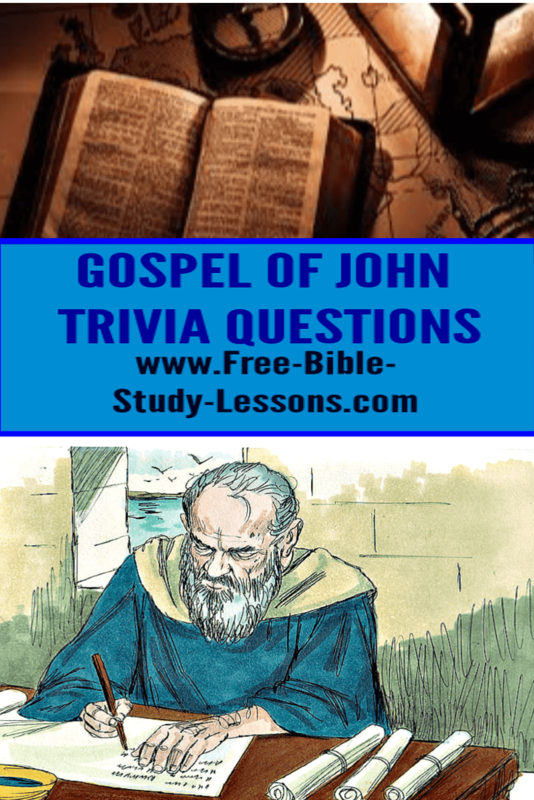 All the answers to these Bible questions are found in the Gospel Of John. You may use either the King James Version or the New International Version. If you are using a different version and can't get the password to work, check out the reference in the KJV or NIV to see if they used a different word/spelling. 2. Make a note of each answer. If the answer is a number, write out the number, i.e. nine not 9. You make also want to make a note of the reference in case you need to double check your answers. 3. After you have all ten answers, go to the Password Decoder section and follow the instructions there. Write down each letter of the password in order until you have completed the password. Note: The password is not an actually word but a random list of lowercase letters - no spaces. 4. Save the password because you need it at the end to decode the Secret Verse. A. Double check your answers in the KJV or NIV. B. In the case where the answer involves two names make sure you have them in the same order as they appear in the Bible. C. Double check the decoder instructions to make sure they were followed correctly. You can work this out yourself or you can challenge your family, friends, youth group, or others, to a race to see who can get to the treasure page first. On the Treasure Page is a Secret Verse [for which you will need your ten passwords to decode]. If you are challenging others, then the first one to decode this secret verse on the last page is the winner. Others can verify the correct answer when they reach the final page and decode the secret verse for themselves. John, the author of the Gospel of John, was one of the 12 Disciples of Jesus. He was one of Jesus’ three closest friends along with Peter and James. Out of the Inner three he was probably the one with the closest relationship with Jesus. He is also called John the Beloved Disciple and John the Evangelist. 1. John the Baptist called Jesus the _____________ of God. 4. Jesus told the Jews that if they believed ___________ they would have believed Him. 5. Jesus said no one could come to Him unless the __________ draws him. 6. The shepherd calls his sheep by ____________. 7. The Spirit of Truth will guide us into all ____________. 9. Jesus told Pilate that the only power Pilate had over Him was given him from ____________. 1. Take the third letter from the first answer for the first letter in the password. 2. Take the first letter from the second answer for the second letter in the password. 3. Take the third letter from the third answer for the third letter in the password. 4. Take the fourth letter from the fourth answer as the fourth letter in the password. 5. Take the fifth letter from the fifth answer as the fifth letter in the password. 6. Take the second letter from the sixth answer as the sixth letter in the password. 7. Take the first letter of the seventh answer as the seventh letter in the password. 8. Take the third letter from the eighth answer as the eighth letter in the password. 9. Take the last letter from the ninth answer as the ninth letter of the password. 10. Take the first letter from the first word of the tenth answer as the tenth letter of the password. If you like Bible Trivia John, try our other Scripture treasure hunts.